Ace your preparation for the skills measured by MCPD Exam 70-548—and on the job. Work at your own pace through a series of lessons and reviews that fully cover each exam objective. Then, reinforce what you’ve learned by applying your knowledge to real-world case scenarios and labs. This official Microsoft study guide is designed to help you make the most of your study time. Assess your skills with practice tests on CD. You can work through hundreds of questions using multiple testing modes to meet your specific learning needs. You get detailed explanations for right and wrong answers—including a customized learning path that describes how and where to focus your studies. 15% exam discount from Microsoft. (Limited time offer). Details inside. 400+ practice and review questions. Case scenarios and lab exercises. Microsoft Visual Basic and Visual C# code samples on CD. 90-day evaluation version of Microsoft Visual Studio 2005 Professional Edition. Fully searchable eBook of this guide. The print version of this book ships with a CD or DVD. For those customers purchasing one of the digital formats in which this book is available, we are pleased to offer the CD/DVD content as a free download via O'Reilly Media's Digital Distribution services. To download this content, please visit O'Reilly's web site, search for the title of this book to find its catalog page, and click on the link below the cover image (Examples, Companion Content, or Practice Files). Note that while we provide as much of the media content as we are able via free download, we are sometimes limited by licensing restrictions. Please direct any questions or concerns to booktech@oreilly.com. Mike Snell, MCPD, MCSD, is a Microsoft® Regional Director with 20 years of software development and consulting experience. He has written several books on Visual Studio® and .NET. Brian C. Lanham specializes in developing Windows and Web based applications using the .NET Framework. I am a Microsoft C# MVP and the founder of Wildermuth Consulting Services, LLC, a company that is dedicated to delivering software and training solutions in the Atlanta, Georgia area. I am also a speaker on the INEA Speaker's Bureau and have appeared at several national conferences to speak on a variety of subjects. 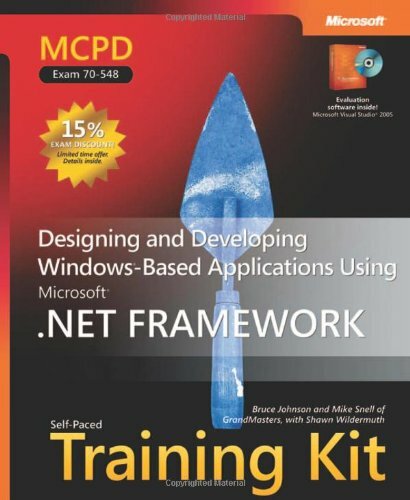 I am the author of the book "Pragmatic ADO.NET", the upcoming "Prescriptive Data Architectures", both for Addison-Wesley as well as co-author of several certification books for Microsoft Press. I have been writing articles for a number of years for a variety of magazines and websites, including MSDN, MSDN Online, DevSource, The ServerSide .NET, ONDotNet.com and Intel's Rich Client Series. I have enjoyed building data-driven software for more than twenty years. Sara Morgan, MCSD, MCDBA, specializes in Web-based applications and the author of Building Intelligent .NET Applications: Agents, Data Mining, Rule-Based Systems, and Speech Processing.